How comfortable is your patio lighing? Blinding lights meant simply for a large blast of light remind the mind of a parking lot, or basketball court. A space that relaxes does so subtly. Low maintanance, soft, professional patio lighting. A well laid out and designed space makes a huge statement to guests and visitors. Most of us work during the day leaving us to enjoy our patio in the evenings, nights, and weekends. Homes come with basic lighting that includes a porch light and well not much else. Our outdoor lighting systems give options that range from moon light, to soft glows that afford privacy while helping you to unwind. Strategically placed path lights, or wall lights glow softly easing the mind and illuminating the patio space so that now you have a personal paradise. Integrated lights keep you from having to change bulbs and provide the least in time spent on maintenance. We want to help you to have the most enjoyable patio lighting. 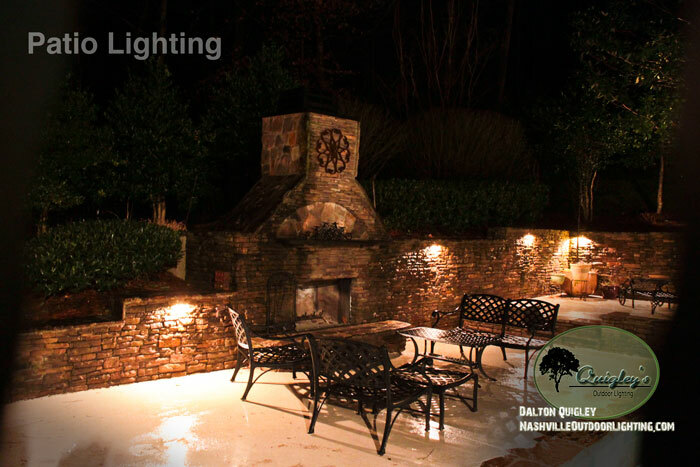 Patio lighting installation on our projects in the areas of Nashville, Brenwood, Franklin, Spring Hill, and Nolensville TN.